BQ2013H datasheet, Pinout ,application circuits NiCd/NiMH/Lead-Acid Gas Gauge For High Discharge Rates (>10A), Pgmable Offset Error & Load Comp. NiCd/NiMH/Lead-Acid Gas Gauge For High Discharge Rates (>10A), Pgmable Offset Error & Load Comp. The BQ2013H Gas Gauge IC is intended for battery-pack installation to maintain an accurate record of a battery?s available charge. The IC monitors a voltage drop across a sense resistor connected in series between the negative battery terminal and ground to determine charge and discharge activity of the battery. The BQ2013H is designed for high capacity battery packs used in high-discharge rate systems. Battery self-discharge is estimated based on an internal Timer and Temperature Sensor Compensations for battery temperature, rate of charge, and self-discharge are applied to the charge Counter to provide available capacity information across a wide range of operating conditions. Initial battery capacity, self-discharge rate, Display mode, and charge compensation are set using the PROG1-6 pins. Actual battery capacity is automatically "learned" in the course of a discharge cycle from full to empty. Nominal available charge may be directly indicated using a five-segment LED Display These segments are used to graphically indicate nominal available charge. The BQ2013H may operate directly from four nickel cells or three lead acid. 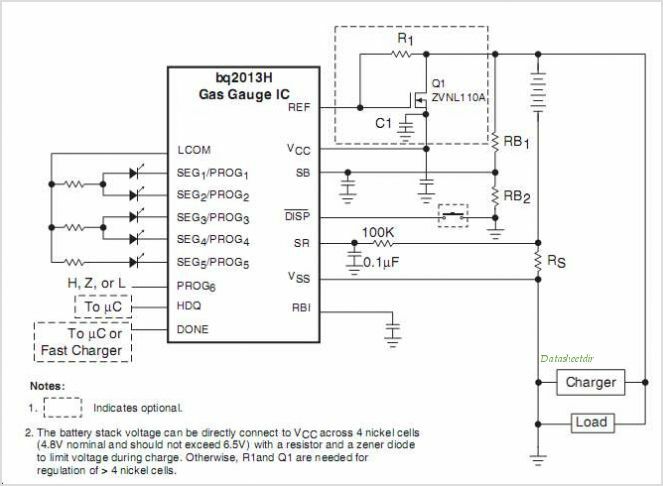 With the REF output and an external Transistor a simple, inexpensive Regulator CAN be built to provide VCC from a greater number of cells. Internal Registers include available charge, temperature, capacity, battery ID, and battery status. 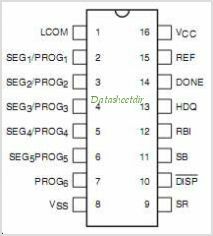 This is one package pinout of BQ2013H,If you need more pinouts please download BQ2013H's pdf datasheet. This is one application circuit of BQ2013H,If you need more circuits,please download BQ2013H's pdf datasheet.